A sewing gauge was the first sewing tool introduced to me in my 7th grade Home Economics class. Well, actually, it was probably the third or fourth, after scissors and pins. So it’s safe to say I’ve been using this sewing tool for 60 plus years. There is one on the ironing board, cutting board, and next to the sewing machine, serger, coffee table, and several on reserve. And none of them look like this itereation. A seam gauge is a multi-purpose sewing tool used primarily for measuring small spaces–hems, seam allowances, button/buttonhole spacing, etc. It’s also a point turner. But the “Best Thing Since Sliced Bread” on this particular gauge, is the button gauge/spacer. See the U-shaped piece at the bottom of the gauge. 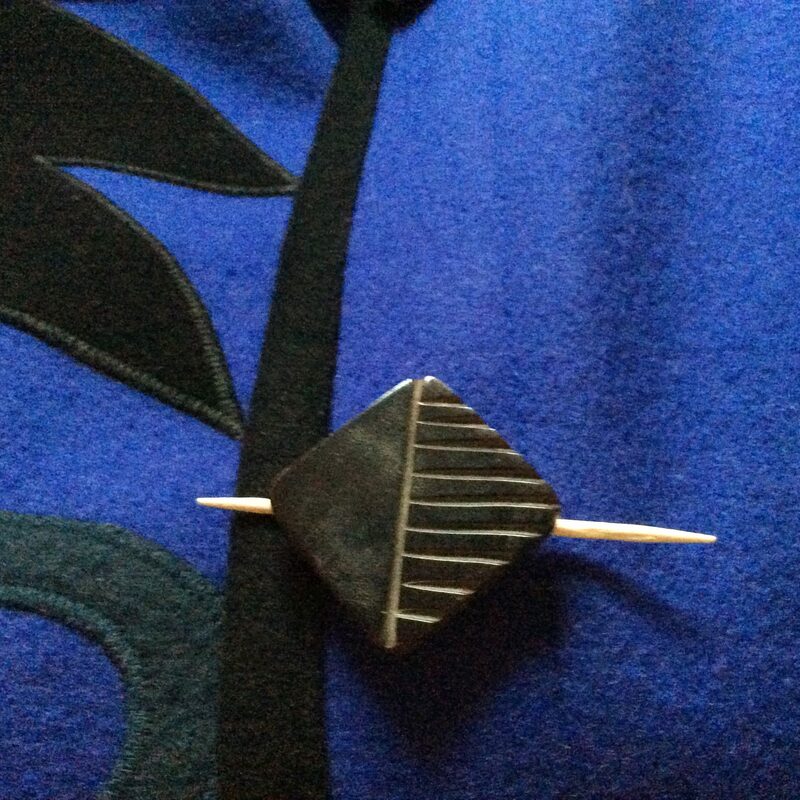 I’ve always inserted a toothpick, aka button spacer, either on top of or under a button, to use as a button spacer. Even Martha Stewart uses a toothpick. The purpose of a button spacer is to elevate the button providing space for the garment overlap to fit between the button and the garment underlap. This is necessary for particularly heavy, thick coating fabrics. 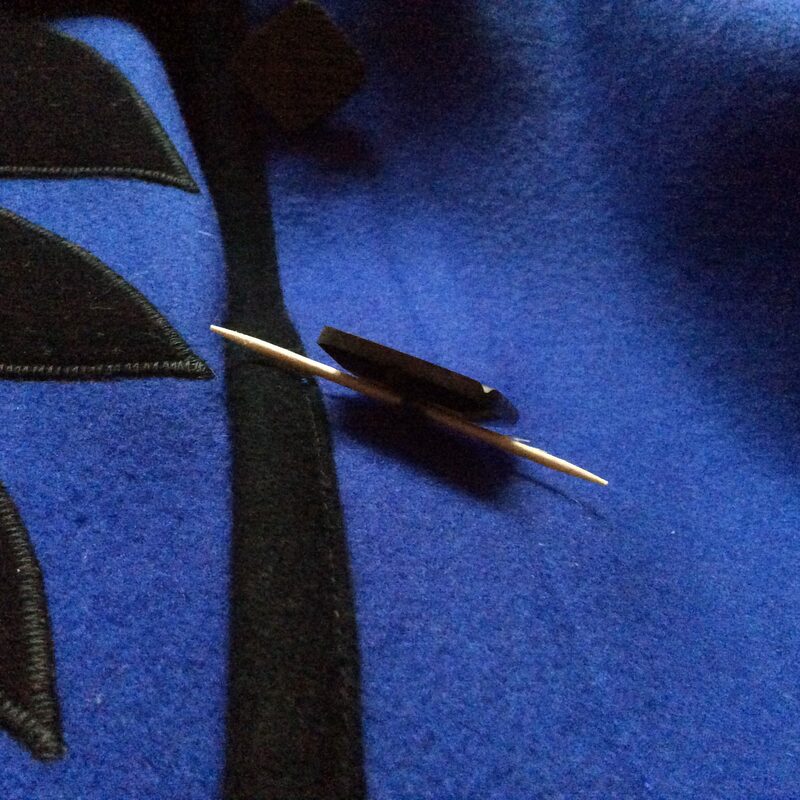 Here is a link to a good blog tutorial on sewing on a button with a thread shank. Thread Shank on a button that already has a shank. As you can imagine, a toothpick is not the best choice for a spacer: it’s small, difficult to hold in place, and it’s sharp. And where is a toothpick when you need one! However, I always have a seam gauge handy, hence also a button spacer. The button spacer on the end of the sewing gauge appears to be large enough to give good support to the button, it’s moveable, and the 6″ length of the gauge makes it easy to control with one hand while stitching with the other. I say “appears” as I haven’t actually tried this particular gauge. When I first came across it a couple of months ago, I could only find it in the UK. As you can imagine, the postage across the Pond was astronomical. Just discovered it on Amazon–and, drum roll, Shipping is Free. It comes from UK so shipping will take 10+ days; definitely worth it. I’m ordering several while I’m at it and will report on the gauge’s usefulness and convenience. In the meantime, here is the link to the article where I first read about the Hemline Sewing Knitting Gauge. House of Pinherio is a well known UK blog. This entry was posted in FIBER FASHION FUN and tagged button spacer, hemming sewing knitting and seam gauge, seam gauge, sew on button with thread shank. Bookmark the permalink.